These quick and easy table runners were made with some left over quarter square triangles that someone gave to me in a scrap bag. There were nine of them, so they ended up as two table runners – one with five of the blocks and one with four of them. The setting triangles and first border are from a light blue dotted fabric. The outer border, a navy fabric and the yellow and blue flowered binding all came from stash. One of the great things about having a large stash is that you can usually find something that will work! They were both quilted the same: a small stipple in the center with a light blue thread and a half feathered pattern with a navy thread around both edges of the navy border. Quick and easy! The binding was applied to the back and top stitched to the front with a yellow thread on top and a clear poly in the bottom. These two table runners will be great to have on hand as quick hostess gifts. Many of my friends love blue, so they will very welcomed when they are given. Goal Status: 41 projects complete and 11 more to go by Dec 31st! I’m glad I did a quick project today. I needed an easy project before I work on a few of the larger waiting projects. 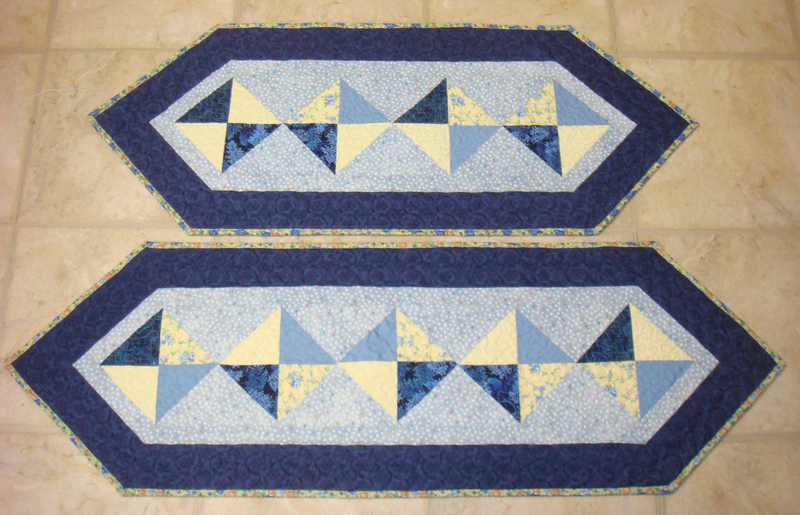 This entry was posted in Completed Quilt Project and tagged Simple project, Table Runner. Bookmark the permalink.